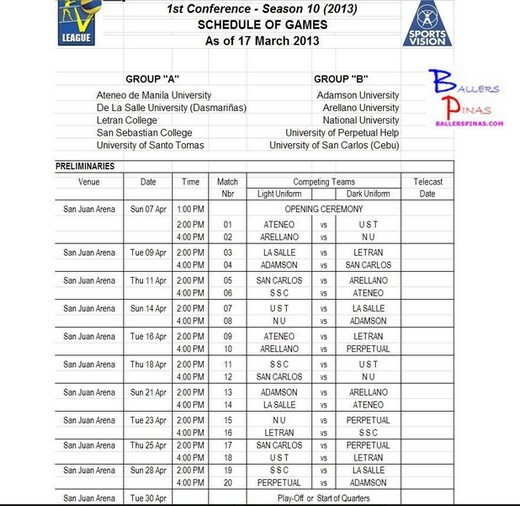 The Shakey’s V League Season 10 First Conference is set to open on April 7, 2013, Sunday at the San Juan Arena. A total of 10 teams will participate this Season. They are Ateneo, UST, Arrellano, NU, La Salle, Letran, Adamson, San Carlos, SSC, and Perpetual. Their participation will definitely make the tournament more exciting and more thrilling. If you’re an avid volleyball fan and you want to watch the games live at the venue, here’s the Shakey's V League Season 10 First conference schedule of preliminary Games. If you’re near San Juan Arena, you’re lucky because majority of the games will be held there. daquis as a guestplayer nyo. Hindi sumali la salle main. Ganda ng laban ulit kung admu at dlsu ang finals. Go Ateneo! We support you all the way... Can't wait to see you in the finals. ONE BIG FIGHT! Pls ans. wer do u buy TICKETS? One Big Fight Ateneo ..
how much po ba ang tickets? ?